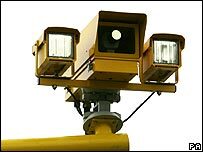 BBC NEWS | UK | Magazine | How do average speed cameras work? Hello. Is it you I'm looking for? With 20mph speed limits now a distinct possibility, average speed cameras are likely to be the tool that enforces them. But how do they work? To their opponents they are "yellow vultures", perched on long poles, waiting to punish the innocent for travelling 2 mph over the speed limit. But they are springing up all around the country as the authorities seek new ways to make people obey the speed limit. The camera-haters, in this instance, can blame the IRA. Each average speed camera is in a pair. One camera - the entry camera - films your number plate as you enter a controlled zone and starts a timer. When you leave the zone, the exit camera films both your car and its number plate. If there's a match with the entry camera, your speed is calculated, and if over the speed limit the evidence is passed on to the police. The Automatic Number Plate Recognition (ANPR) technology on which the camera relies was invented in Britain and first used on a large scale to secure the City of London against the IRA in the famous "ring of steel". Now its use as a more general crime-fighting tool and traffic control technique is spreading around the Western world. The UK has a national network of ANPR allowing police to track car movements, most notably used to track the getaway car of the killers of PC Sharon Beshenivsky in 2005. The average speed cameras - or Specs - are produced by Speed Check Services (SCS) in Camberley and are now installed temporarily at many roadworks sites and also permanently in many areas. The town with the most is Nottingham. First used in 1999, each pair of Specs is allowed to be positioned any distance from 200m to 10km apart. In practice, most are a few hundred metres apart, says Paul Davey, managing director of SCS. "You do need to keep reminding people they are in a speed controlled zone. Too far apart and people forget." Also, placed further apart, people could speed up and slow down to keep their average below the limit, while still having broken the law. But the critics have accused the cameras of allowing a less complicated dodge - changing lanes. Each pair of cameras covers one lane. So in theory, if you are clocked in the fast lane, and you then changed to the middle lane just before the exit camera, you would not be caught. But Mr Davey says this would be difficult to pull off, as each section covered has a number of cameras and drivers would not be able to see which one was paired with which. You might be picked up by entry camera A, speed down to camera B and change lane only to find that that was also an entry camera and that either exit cameras C or D would get you further down the road. And the cameras slow more people down, Mr Davey suggests, producing a smoother traffic flow and avoiding the tiny go-slows around the old-fashioned spot speed cameras. But Hugh Bladon, of the Association of British Drivers pressure group, says the new cameras still cause sudden braking by panicked drivers, but also now cause long stretches of crawling traffic. "People see a camera and immediately put their foot on the brakes," he says. "It doesn't lead to good driving. You get people driving along and their eyes are glued to the speedometer rather than to the road. "In towns people who should be looking for children between the [parked] cars will be looking at their speedometers." We have these on the A14. They do not solve the underlying problems of the area - too many lorries and inadequate roads. Alot of people do not concentrate enough on the road as it is, so supplying cameras casues random breaking and sudden lane switching as well as people not paying attention to anything other than speed which will ultimately lead to unsafe roads. "Safety cameras" are far from safe. These things are a menace. Several times in recent weeks I have seen people panic braking on the M1 roadworks near junction 32, to the point where accidents have only been narrowly averted. I almost ran into the side of one car which suddenly "outbraked" me as I was changing lanes. I can't see the issue here, it is the same as traditional speed cameras, you break the speed limit you get fined if you don't break it then you are fine. What is the issue here? These cameras have a major flaw. Who are the worst speeders on our roads ... Motorcycles. How do these cameras work... they photograph your front Licence plate. Do motorcycles have front licence plates ...... NO. Is it just me or is that crazy!